We have a luxury promotional gift department here at CL Promotions, this includes our Personalised Zenith weather station. Our Personalised Zenith weather station is brushed with a satin finish to make this product a highly stylish luxury item. 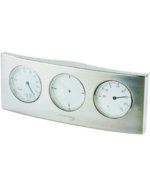 It includes a Clock, Thermometer and Hydrometer, to ensure a pleasant atmosphere for all visiting clients. This item would look very impressive on a desk with your business details and logo engraved on, strengthening your corporate identity and encourging repeat and new business. So advertise on our Personalised Zenith weather station today! Other promotional and personalised items besides our Personalised Zenith weather station. To find out more about our Personalised Zenith weather station fill in the contact form and we'll get straight back to you.